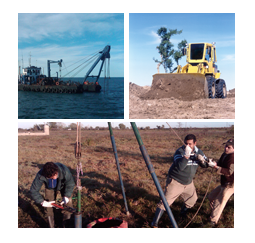 In all its operations, works and developments, Pentamar considers the protection of the health and security of its employees and of third parties, as well as the preservation of the environment, of the utmost priority. In this sense, all the projects and developments are submitted to studies of environmental impact, and to the approval of the corresponding regulating bodies. To reinforce its commitment, Pentamar promotes within the organization a culture where the importance of individual contribution is valued and acknowledged , and guarantees its commitment by fulfilling all the legal requirements and regulations ruling the activity. Pentamar is conscious about the importance of the role played by the private sector in accompanying the efforts made by the State in issues of social development. In this sense, and following the principles of sustainable development, that is to say in search of the balance and harmony existing between the company, the environment and the community, Pentamar accompanies Cimientos Foundation in the Help Schools Program in order to promote the improvement in the quality of the education in the schools of our country. "Towards a Mathematical Literacy Proposal" Escuela Primaria Básica N°19 (Tigre), where the students are expected to use different mental calculation strategies in order to solve problematic situations. "Reading: an adventure" Escuela Primaria Básica N°54 (Tigre), where it is expected to promote among the students a greater taste and love for reading. The projects are in the stage of implementation, and a great enthusiasm and commitment in students as well as in teachers, can be observed. 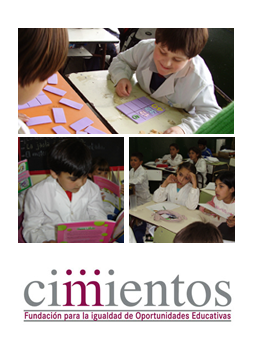 Cimientos Foundation is a non-profit organization whose mission is to promote equal education opportunities through programs which favor school inclusion and improve the quality of the education received by children and young people coming from families with low socioeconomic resources.